President of the Senate, Bukola Saraki, has reacted to the Appeal Court verdict that struck out 15 out of 18 charges filed against him by the Federal Government of Nigeria. Saraki said the court’s verdict, which agreed with the decision of the Code of Conduct Tribunal that he had no case to answer on 15 of the 18 charges filed against him has vindicated him. He said this in a statement Tuesday night by his Special Adviser on Media and Publicity , Yusuph Olaniyonu. 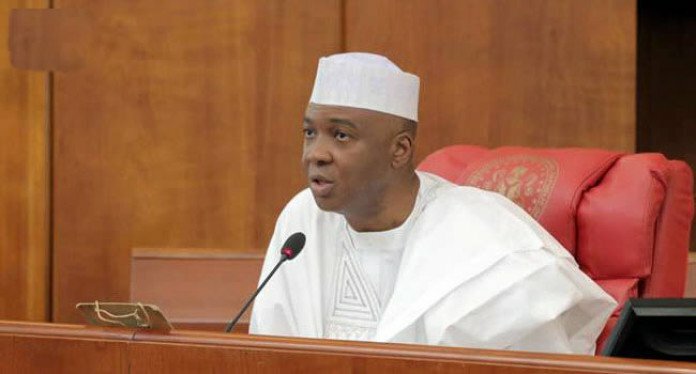 The Senate President said, “We believe that upholding the no- case submission by Dr . Saraki with regards to 15 of the 18 counts charges vindicates the innocence of the Senate President. “At least, today ’s judgment has confirmed the position of the tribunal that the prosecution’s case was entirely based on hearsay, not on any concrete evidence. “The verdict of the Court of Appeal, just like that of the tribunal before it , aligned with our position that the preposterous claims made during trial by the prosecution concerning operation of foreign accounts, making anticipatory declarations, collecting double salaries, owning assets beyond his income and failure to declare assets owned by companies in which the Senate President owns interests, among others, have fallen like a pack of cards and lack any basis. “On the remaining three counts, which really touch on two issues, referred back to the tribunal for the Senate President’s defence, it should be noted that the appellate court only gave a summary of its decision today, promising to provide the parties with Certified True Copies of the judgment soon. “As soon as it makes the details of the judgement available, our lawyers will review the grounds of the decision and take appropriate action. “We remain convinced about the innocence of the Senate President on the three or two counts because we believe the decision of the Court of Appeal is not consistent with the submissions made by both parties at the tribunal. Thus, it is our view that that aspect of the judgment will not stand.